We have just celebrated the Feast of the Assumption of Mary. 15th of August is important for India in another way to. It is also the independence day for India. This year it was the 68th. Every year the day is celebrated with a lot of pomp and joy. 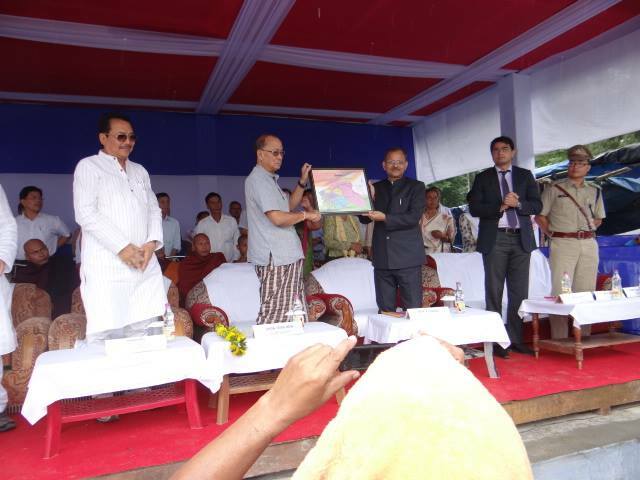 This year, in Arunachal Pradesh it was unique as that was the day chosen for the inauguration of a new District. This new District called Namsai District is in the middle of our Diocese. It is an area inhabited by many tribes. The Khamtis are the main tribe and they are mainly Budhists. Namsai township already with good connectivity to Arunachal and the rest of India is also an educational hub for the state. Already a university, two colleges an a Technical Institute. More are on the way. What was impressive about the day was not the huge crowd inspite of the heavy rains, the colourful dances, the absence of long speeches etc., but the organizers had given priority to an all religion prayer. Bishop George of Miao Diocese was asked to represent the Christian churches. “It was a rare privilege to bear witness in front of such a huge crowd and political, civil, administrative and tribal leaders with very few Catholics among them”, said Bishop George. The children of our school at Namsai sang a nice hymn and Bishop George said the prayer after that. The people were enthralled to see their children sing the hymn. We pray for the progress and growth of this new District.